Touchscreen interfaces present critical accessibility concerns because they do not offer tactile cues for the visually impaired users to distinguish interaction controls. The recent advancement of interaction technology makes new design solutions possible. This research examines blind users’ performance and perception of gesture and auditory feedback designs. Findings from this three-phase study indicate that pressing is the most accurate and slightly faster selection gesture, as compared to lifting finger, tapping, or double tapping on the screen. 12 blind participants were able to navigate touchscreens as first-timer users, if facilitated with instant auditory feedback. For text entry tasks, blind users need more advanced assistive tools such as speech recognition. 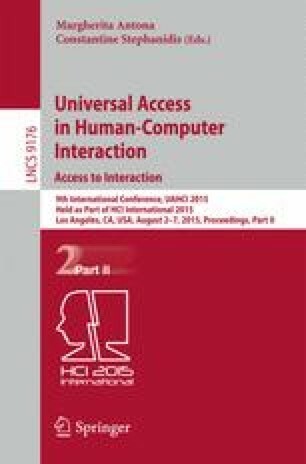 Design guidelines to improve accessibility on touchscreens are discussed in this paper.